I was born with no sense of smell. None, nada, zilch. If someone is using a solvent like acetone or something, I can taste something in the back of my throat – but that taste is the same as someone spraying Fabreeze or perfume. If I walk into a restaurant or even into a house where someone is cooking, I cannot identify what kind of food they are making, I just get a sense of moisture in the air. Italian, pot roast, Mexican, Thanksgiving dinner – all the same. Bath and Body Works is a mystery to me, so is Yankee Candle. I make my choices by the colors of the products – will it look good in my home? Friends are always putting things under my nose and saying how good they smell. I don’t want to make them feel bad so I just sniff away getting nothing from the experience except that there was some sort of sharing going on. That’s thoughtful and I appreciate it. If I were picking a sense to lose, it would be smell. I hear people talk about bad smells more than good ones. It seems smell can really set people off. I hear complaints about body odor, chemicals, the chicken plant down the road. I am happily oblivious. 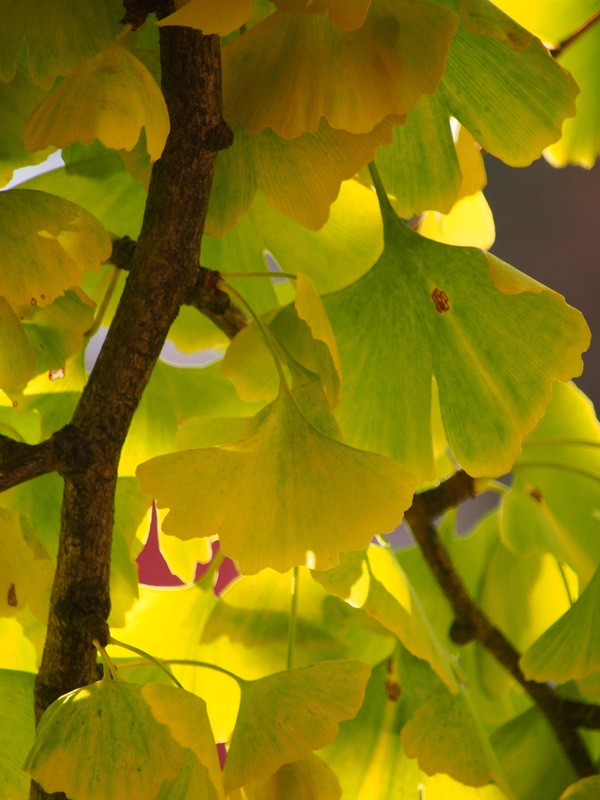 Sometimes I get to find the beauty in something that stinks, like the ginkgo tree. Last month I read a post by Mrs. Fringe about autumn in New York City. She talked about the fruit dropped from this stunning tree in terms of it’s vomit-like aroma. 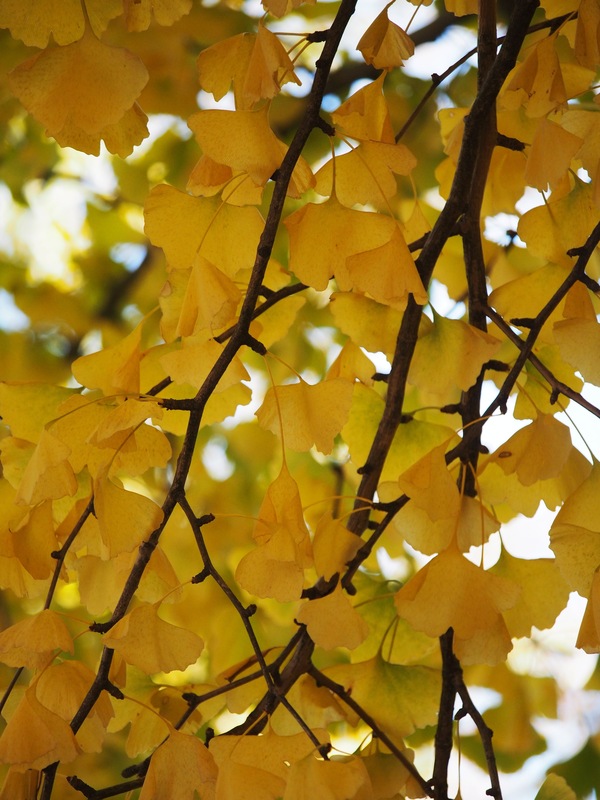 Here in Eureka Springs the ginkgo is one of the last trees to show off it’s color. We have several located downtown right near the post office. For years I have headed there late in October to take in the glorious color of the last of the fall. Every year I see scads of photogs milling around the fading maples on the other side of the street. I seem to be the only one who loves this tree. I heard a friend mention the annoying fruit – there is sooooo much of it on the ground in the late fall and they are not pretty. Apparently this friend didn’t see the need to mention that the fruit stinks. My friends always forget that I cannot smell anything. So every year I wander through that fruit without worry, with no clue that I am crushing fruit that smells to high heaven underneath my shoes. This year I took a friend with me to shoot this wonder. As I stood in the grass shooting upwards I heard her exclaim, “That smell, there is dog crap somewhere nearby, and lots of it!” You see I had forgotten all about that informative blog by Mrs. Fringe and was once again blissfully unaware of the stink I was in. I kind of like my fragrance free world. 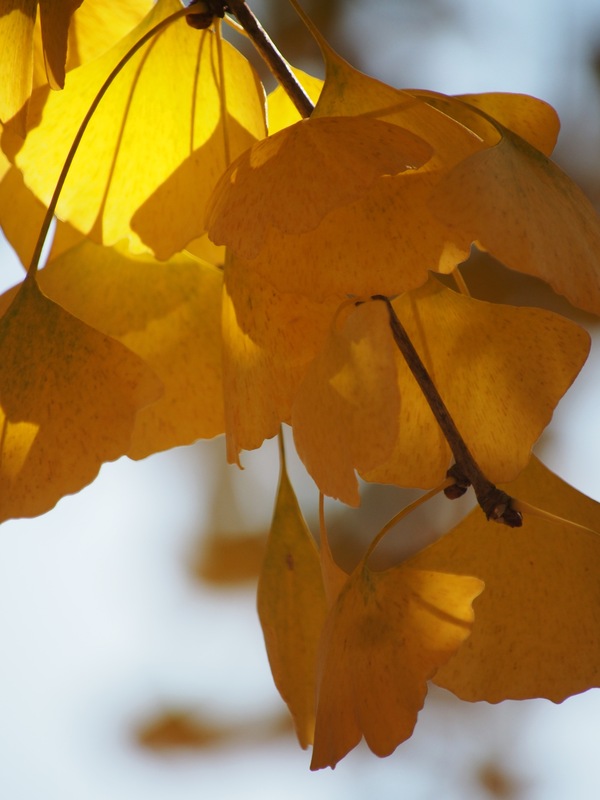 This entry was posted in foliage, Ozarks, Photography and tagged color, fall foliage, fruit, Ginkgo, Olympus, Olympus E-M5, Ozarks, photography, stench by artsifrtsy. Bookmark the permalink. These trees are beautiful but I remember my first incident with their fruit. Freshman year of college and they were on campus, steeped onthe fruit and then had to sit through class convinced I’d stepped in dog poop. Pretty awful and embarrassing! I had a similar experience with the person who was shooting with me this day, she was looking for the dog poop – but it was just fruit. 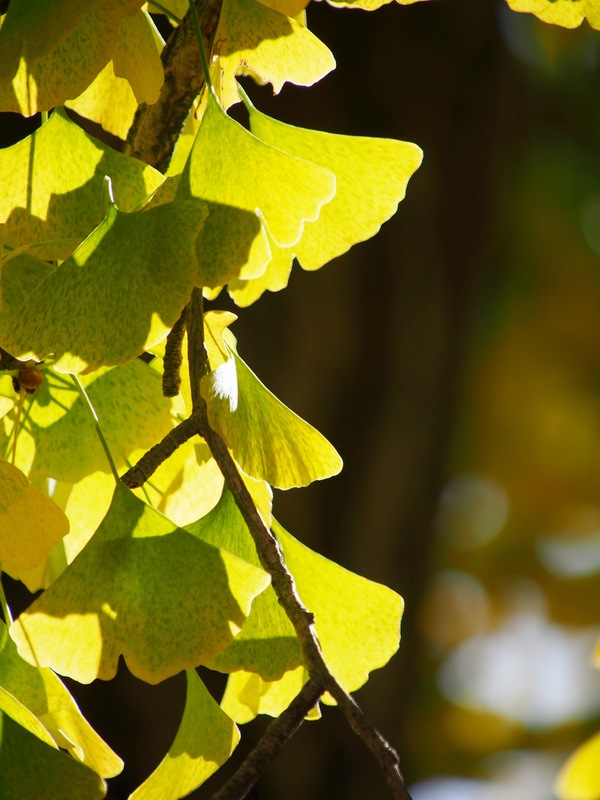 We done have Ginko Biloba here (to my knowledge) – I’m in the UK – and I didn’t know it smelled bad. I used to have a very keen sense of smell but as get older both that and my sense of taste have decreased. Does your inability to smell also affect your sense of taste? That’s often the way it goes. Thanks – I am often asked about taste – but I really can’t understand how they are connected. I do know the foods I don’t care for all have a mushy texture. The nose and tongue senses are connected. So when people get a cold and can’t smell they often can’t taste either. But it’s probable that you were just born literally lacking the sense of smell and only that, so the usual connection may not follow. That makes sense – I can’t tell the difference when I have a cold. 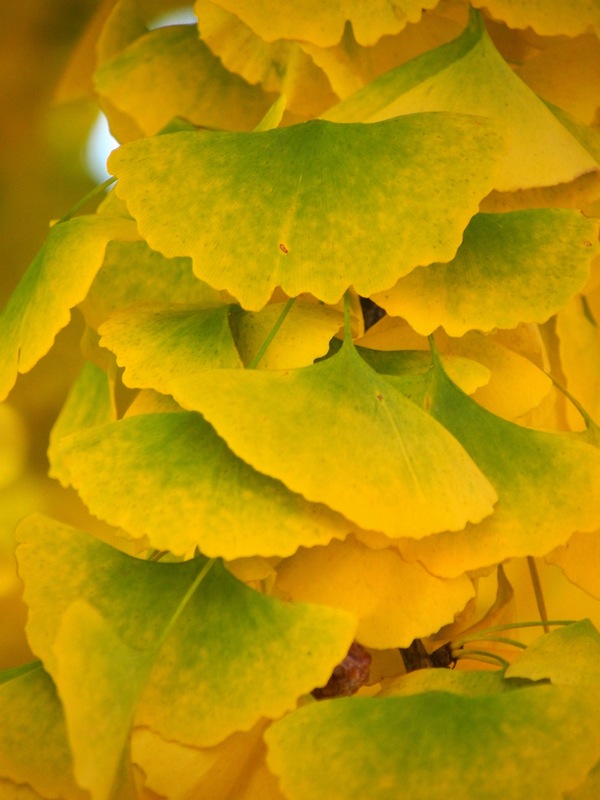 I love the Ginko though. I may be the only one who does. I didn’t know that about this tree! And my smeller is a good one (and yes, a curse) so thanks for the warning! Love the fall color! I worry that the shoes I wore shooting it could be a total loss. Of course, who will tell me if my shoes reek? Whew – I used to have a pal that would stop by the house and let me know if it all smelled OK.
I’ve never seen or smelt that tree but it looks amazing. I was interested that smell would be the first sense that you would give up. As you mentioned, you certainly miss some unpleasant smells along the way. Thanks for posting. 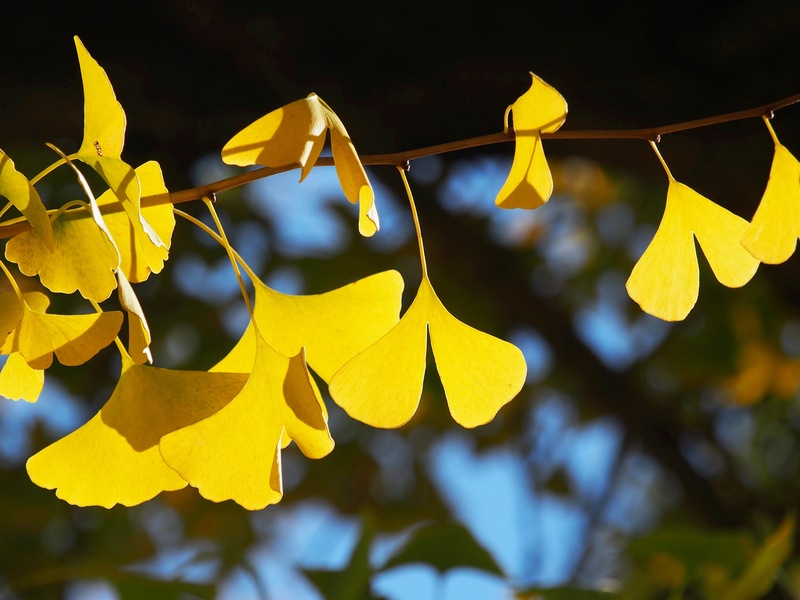 I love the ginko even though I can smell the fruit. The bright yellows are so uplifting, especially against the clear blue skies of autumn. In Japan, people (including my husband) collect the fruit, shell, roast and eat them (though only a little at a time because they can be harmful if eaten in too greater numbers). Thank you. I had no idea you could eat the fruit. The trees produce so much fruit. LOL – maybe that’s what we need here. Beautiful photos, I love the yellows and greens in the leaves. I went to school in Atlanta for two years and that was where I first saw a Ginko tree. I fell in love with the leaves when they started turning yellow because we didn’t have a Fall season in south Florida. Thanks for the reminder and the warm memories of Atlanta. Thanks Allan – I love these trees, they almost flutter in the wind. I didn’t know they were common in ATL – but it sounds like they are pretty common throughout the south. I remember mrsfringe’s post! 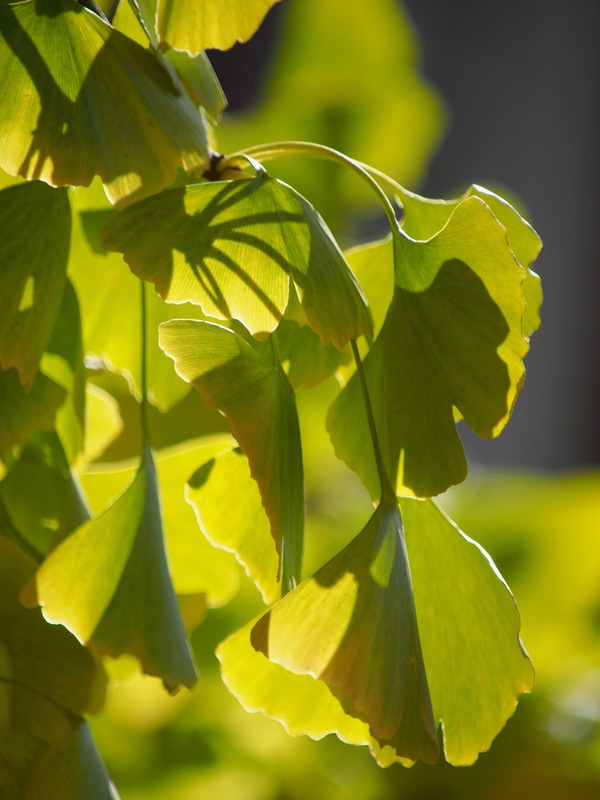 Had never heard of the Ginkgo tree until that post. No sense of smell? I wonder which of your senses is heightened then? Can you taste? I’ve heard smell and taste are linked. As always beautiful photos. LOL I love your sense of humour! My husband has “Hyperosmia” the ultra-sensitivity to smells. You have anosmia. I wish the two of you could get together and even things out! There’s even a name for it – cool! Thanks!! It pays to be on good terms with a fake medical professional, doesn’t it? LOL – it sure does! I have a super-sensitive nose, too. It’s hard to imagine not smelling. I smelled a gas leak from a corroded pipe under our front yard, so that was good. There are plenty of smells I would have been happy to never have smelled, though – most of them involving my family’s laundry. 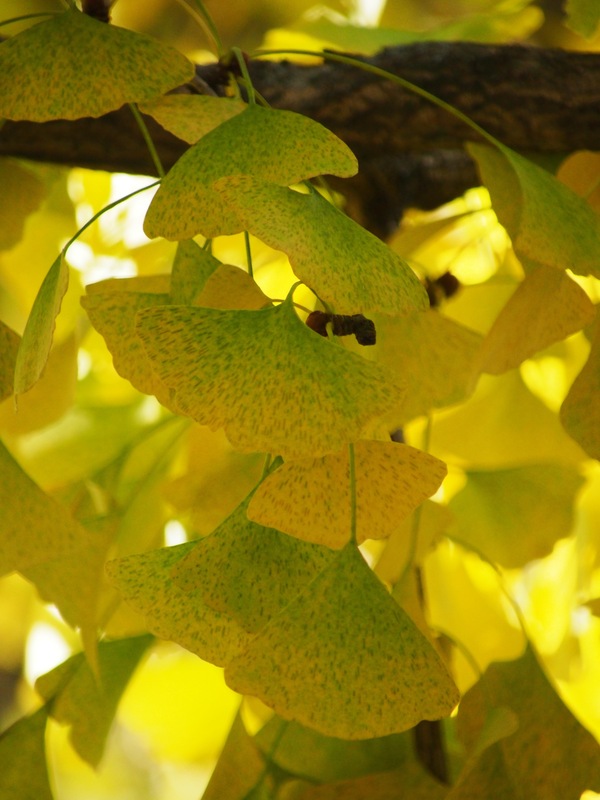 I didn’t know that the ginkgo tree smelled or had noxious fruit. We don’t have any near us. I do love the unique shape and colors of their leaves. Beautiful pictures as usual! I love all the descriptions of smells – they are almost vivid. I think I have the same reaction to color. The shiny aqua blue of Mom’s drapes in the living room, the ruby red of the amaryllises in Grandma’s garden, the almost sapphire blue of Crater Lake, the metallic blue of Grandpa’s impala – I see the colors in another context and it takes me right back. I had a coworker that seemed to have bionic olfactory abilities, but for her it was mostly what disturbed her – the smell of the printer toner when we printed film would cause her to relocate for the day. I actually worry that things like me or my house or my dogs stink – I’m clueless. It makes me a cleaning fool sometimes.